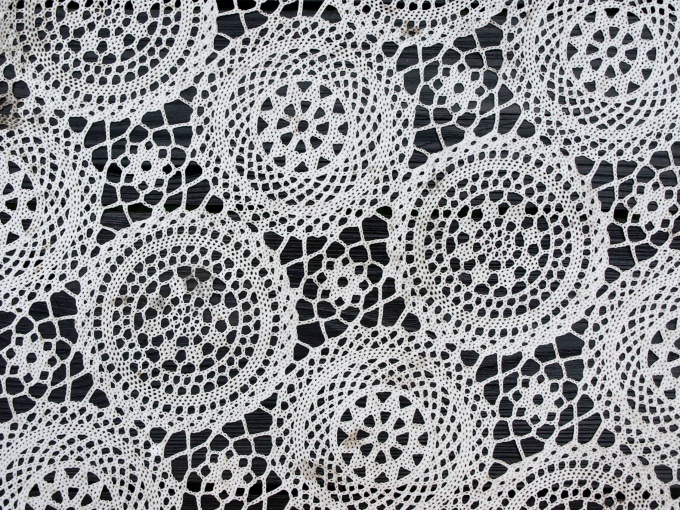 The knitting of individual motifs and their subsequent connection is used in many techniques of knitting crochet lace fabrics. It could be technique friform, and Irish lace. The connection of the individual items using the grid is the last step in creating clothes and interior items, and can be performed in several ways. Thread, hook, needle, pins, pattern. Take related you the motives and pattern of the finished product. Place motifs in such a way as would like to see them on your shawl or jacket. For convenience, pin their pins. You can create your unique composition, and can watch on the Internet the works of recognized masters and try to repeat their pattern. Firstly, it is possible to associate a fillet mesh, decorating it and then the individual motifs. This mesh tally cells. To start, tie one or two air loops and one column. This is the basis of your openwork mesh. Bind the column and air-loop until, until the grid reaches your desired size. The size of the cells on your fabric is determined by the number of the stitches. Then, the finished mesh sew separate motifs, adding to the perfect picture. If desired, the edges of the mesh, you can tie the fringe. The lace motifs can be joined with brides and chain loops. Bride – thick cords that can be linked, just povezav a chain of air loops in the opposite direction. Also can be folded several times long thread and obratiti her other thread – get a strong cord. Bride fill the background and give the product a special elegance. In the same way as motifs, with a chain of air loops they are involved in the painting of the finished product. If you want your finished product was dense and warm, the motifs can be made between a needle. Lay out the pattern the pattern, only in this case motives should closely adhere to each other. Pin the motives of the pins to the pattern – so it will be easier to work with. Then take your needle with matching colour thread and sew the motifs together. If creating a pattern for the subsequent connection of the lace motifs you are not given, it is better to order it from the seamstress. Indeed, in the case of the wrong construction of the pattern and joining motifs on it, you will ruin your product.